This was something impressed upon me by my father as I was growing up. He was a complicated man in many ways – warm and charming at times, while cold and critical at others. He was a hard man, with strong principles. And although he wasn’t always kind or fair, he is remembered by many as having possessed a strength of character and integrity. But what is integrity? There has been, and continues to be, much written about integrity. Integrity by its very definition means everything – as it’s derived from the Latin word ‘integer’ which means whole or entire. But whole or entire in what sense? Wholeness implies that nothing has been omitted, or removed – while entire suggests a state of completeness or perfection. But how does this relate to having or lacking in integrity? Integrity is most often defined as doing the ‘right’ thing even when no one is watching. However, while often clear from an ethical perspective, how do we assess what the ‘right’ thing is when not guided by ethics, rules, or guidelines? What is the ‘right’ thing when viewed through the lens of our individual values and moral code? I feel that integrity is a composite of honesty and consistency. While being honest with others is important, it’s even more critical that we’re honest with ourselves – which itself requires a degree of self-awareness. If we’re honest with ourselves we know intrinsically what the ‘right’ thing is – without having to look to laws, rules, or a code of ethics. The question then becomes less of doing the ‘right’ thing, and more a question of being honest with ourselves and others. Why is honesty important? Being honest and transparent enables us to be viewed as authentic, which engenders trust – the foundation for any healthy relationship. Consistency means more than simply following through on our commitments – it requires the complete (‘whole’ or ‘entire’) alignment between our words and our actions and vice versa. Why is consistency important? Being consistent enables others to rely on (trust) their expectations of your future behaviors based on your past comments, commitments, or actions. Consistency supports trust – trust that others will act or speak in a manner that aligns with our expectations. Perhaps nowhere else is integrity more critical than in business and in the workplace. 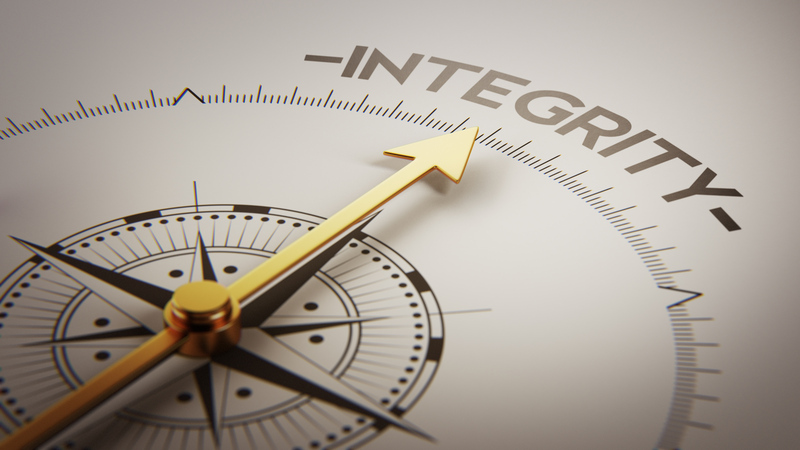 Integrity is often held up as one of the values that employers seek out in prospective employees, while it’s also attributed to strong and effective leadership. Yet despite this, integrity is unfortunately often limited to corporate values and/or mission statements. Individuals in leadership roles can often be prone to be inconsistent with their comments, messages, and actions – as they focus on managing instead of leading – but integrity shouldn’t be limited to those in leadership positions alone. Consistency doesn’t require honesty, and honesty doesn’t require consistency – but integrity requires both.